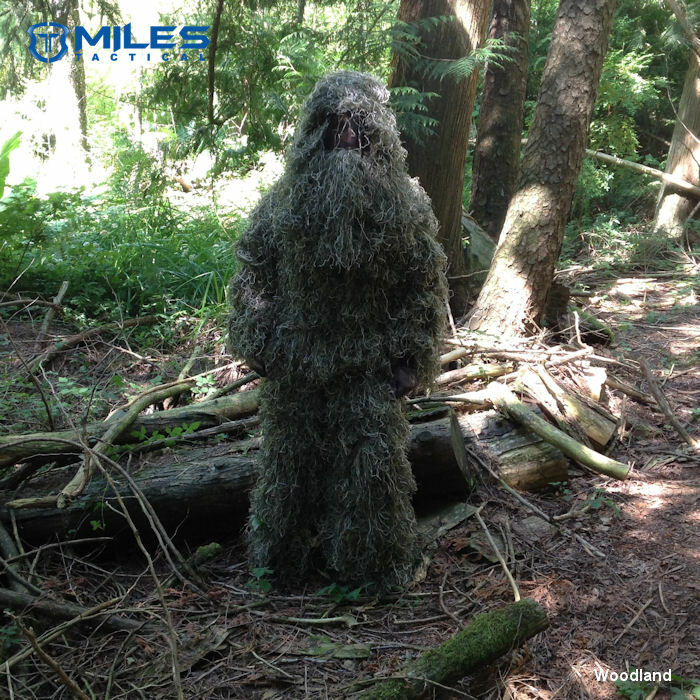 The Bulls-Eye is a full coverage Suit that will help conceal you and your rifle or bow from head to foot. It also has a few advanced features. 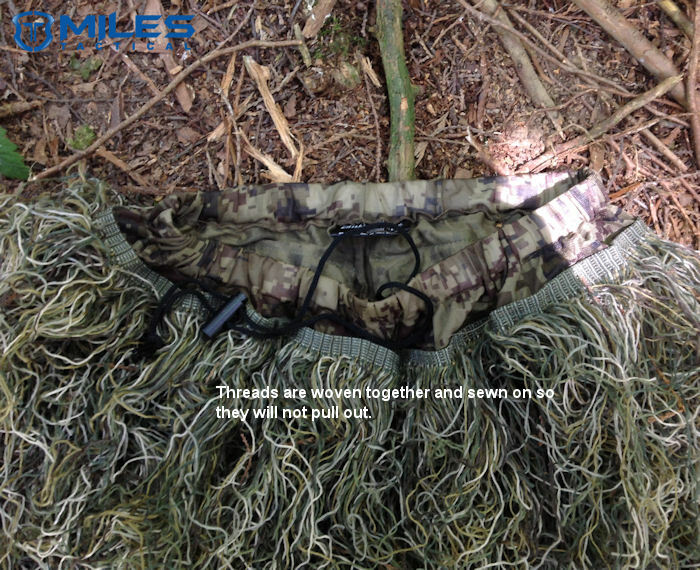 The Ultra-Light Jute is attached to the suit in such a way that it will not pull out when you snag up on something. We have also cut slots in the jacket so you can access the side pockets of anything you are wearing underneath. It includes a draw string duffel bag for easy transport and storage. The Bulls-Eye suit has a 2 layer construction design. The first or base layer is a lightweight breathable No-See-Um fabric. Using a shell like this as a base makes the suit more comfortable to wear and feels smooth to the skin so you can wear a T-shirt underneath. 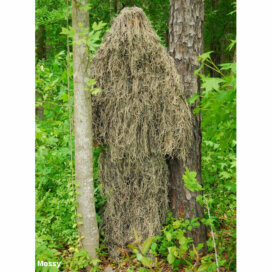 The Ultra-Light Jute is attached so it will not pull out when you snag up on branches or brush. 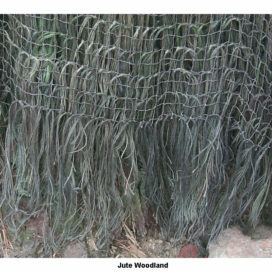 The Jute is first woven together and then sewn on the the base layer. Breathable Inner No-See-Um fabric Shell. Openings in Jacket pocket area so you can reach your clothes underneath. 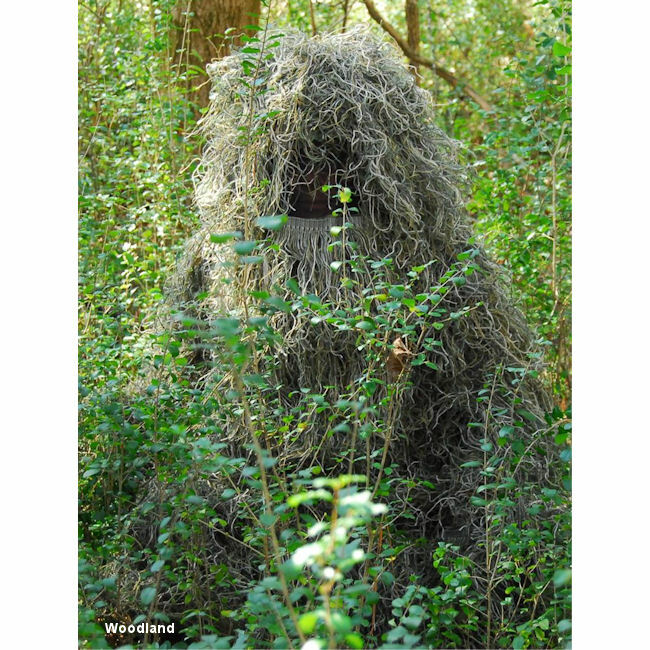 Inner Camouflage No-See-Um fabric Shell. Snaps on the cuffs to make it easier to pull over shoes. This is a pull over hood with a bug liner in the face area. It has a drawstring to secure it under your chin and also a drawstring to tighten it around the top of your head if necessary. The Rifle Wrap is an elastic band with Ultra-Light Jute attached . Simply wrap it around your gear and secure it using the elastic Loop Ends. Bought this for my son (5’-5”) and it fit great. We had to tighten the drawstring waist but it was fine with lots of room to grow for years to come. Very well made and nice quality. We are very happy with our purchase. The online chat feature on website made it quick and easy to get my questions answered right away. I chose priority shipping for just $1 more and it came in just 2 days. I’ll probably get another one soon for my other son. Got the 4 piece a few weeks back before bow season opened up in Georgia, was sitting on the ground at the base of a pecan tree. Had my bow in my lap sitting indian style with an arrow knocked and ready to go. Had several birds land on my bow and squirrels climbing on me, at one point i even had a large hawk land on my head and scared the hell out of me. Suite works great and is pretty comfy, was very impresses at the fact that the suite fooled a critter with the best set of eyes in nature. Will definitely buy another one from this company in the future. I thank that would have a lots to do with scent?????…????? 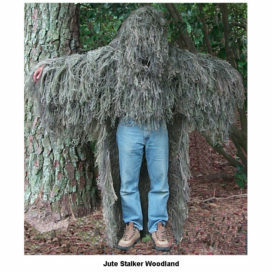 Just what I needed for turkey hunting. Those birds have very keen eyes. This will keep me covered and close. I bought it for my son and HE LOVES IT!! It is very comfortable and light weight, yet it is very full where you can not even see the material underneath that it is sewn to. I am very pleased with the ghillie suit, very well made and works great. My son and I had wildlife walk right up to us and act as if we weren’t even there. I recommend this to anyone looking for a good camo alternative. Thought the suit was well made but was not best for my application. I used the suit for hunting. 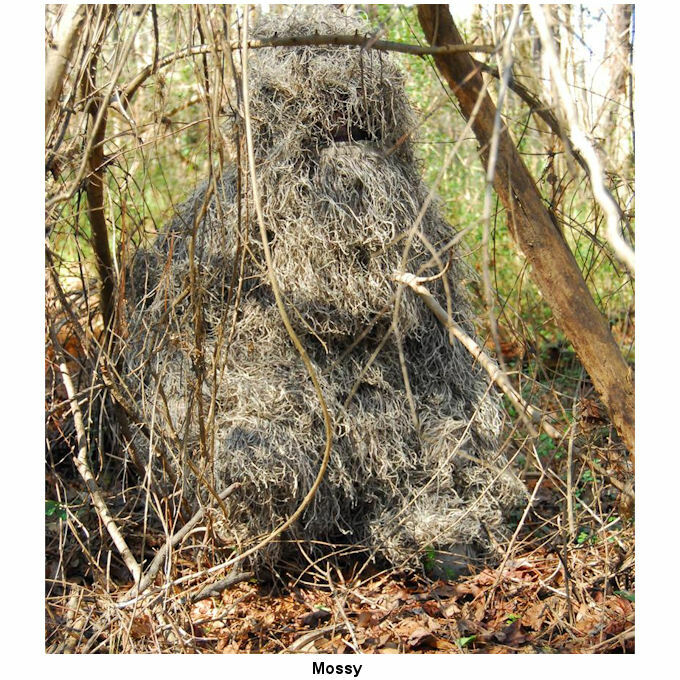 The manner of hunting was stalk meaning I am walking and moving. I hunt in large mature old growth hardwoods with little undergrowth. Yet the movement meant the suit was regularly catching and hanging. I was also soon dragging quite a pile of sticks and debris behind. The legs would pick up briars etc. and catch to the other leg making movement difficult. 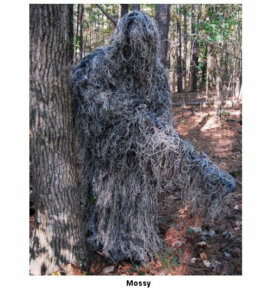 I was tangled in something most of the time which created noise defeating the advantage of the camo. I again thought the suit was well built and am not dissatisfied with the quality. I love the suit. The quality is unbelievable!!! I can’t wait for Turkey season…Thanks again. Great Product. Loved the ghillie suit and the company was easy to work with. Will order from this company again. Perfect gift for my boyfriend! Product is high quality! I was amazed at how inexpensive it was! our son is thrilled with it!! 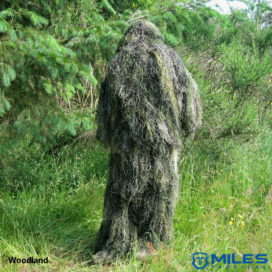 Great quality for the money, only drawback is string layers are a little thick on the chest & arm area for bowhunters. Excellent quality, very pleased with everything. . Very satisfied with the Ghillie Suits, service was excellent, quality is excellent. Will definitely do business with your company again. will suggest your company to anyone I know who wants one ! 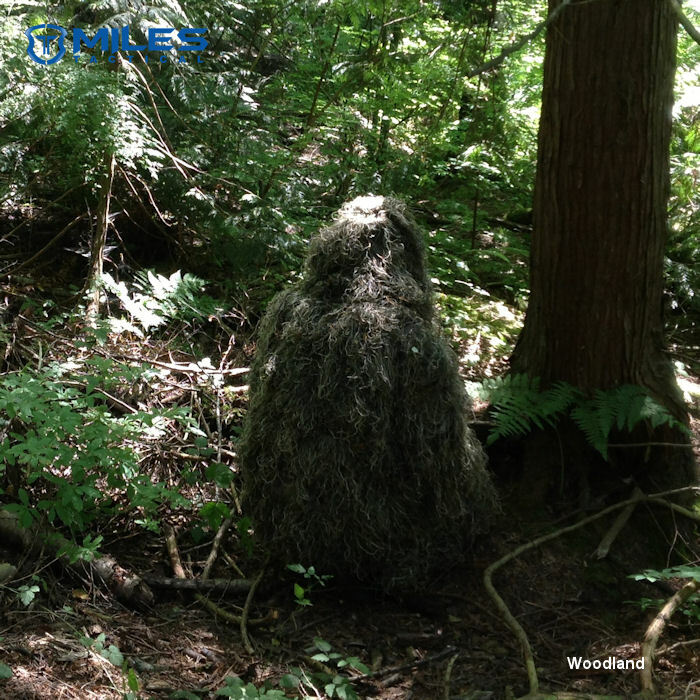 I received my ghillie right on time. I was a little worried about ordering the L/XL …. I’m 5’8 and wear 34-30 pants. So far I’ve just tried it on and it fits good all over but the waste is a little loose. It seems to have good coverage and stitched ok. For the price it seems to be worth it. I only wish it was made in USA. 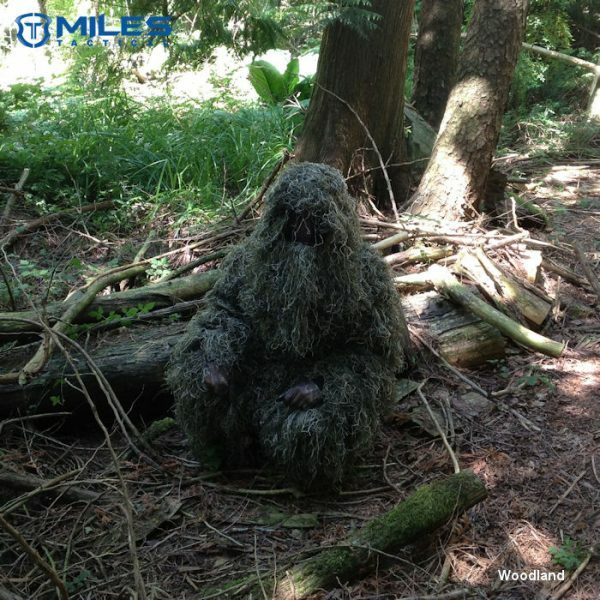 Ghillie arrived quickly and in it’s own sack. After hanging and pulling through all the string, the suit looked perfect. Had some loss of string but that is to be expected and I quickly gathered it all and used it on my rifle wrap. 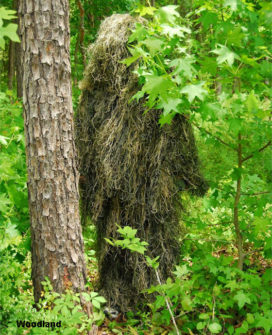 Very lightweight, easy on and off and blends in well. 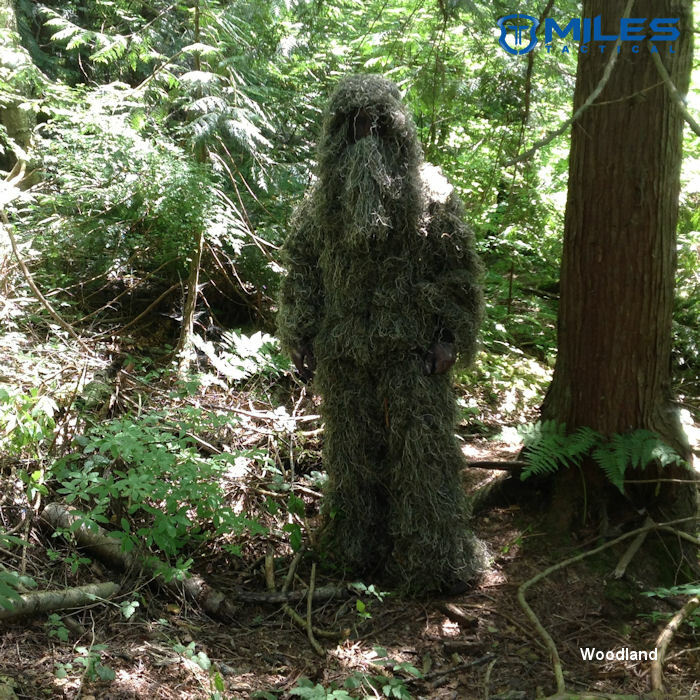 Wife and kids walked within one foot of me and never detected my presence and yes, I scared the daylights out of them. I’ll definitely be buying a few more. Very happy with purchase. My grandson used it as a Halloween costume. He had lots of fun camouflaging himself in the yard and scaring trick or treaters! They were a hit with my 2 grandsons and they came at the most valuable time, Christmas Eve. They were for my 12 and 15 year old grandsons and it was one of their main presents. They loved!!! them. 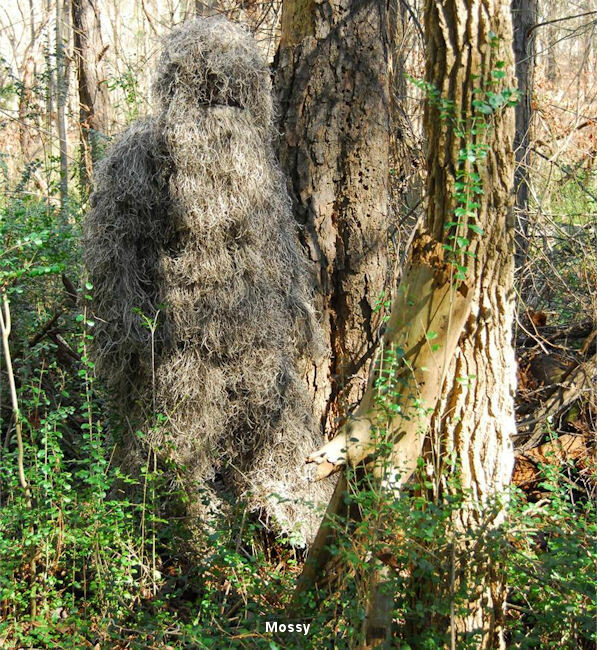 I think my Ghillie suit is great! I really like it and enjoy using it. It works well. Thanks for getting it to me asap. 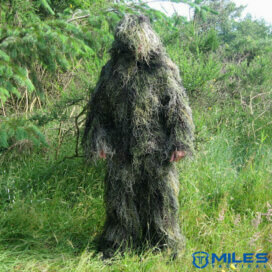 We bought 2 of these suits for Christmas for our sons to play with and scare their friends. They are holding up well after being tried on by the whole neighborhood. They will fit a wide range of adult sizes. The top is a button up jacket with a hood and pants are drawstring waist. I would suggest investing in a box of some kind for storage. They are made well and I feel worth what we paid. I have finally had a chance to check the suit and it is excellent. This was a B-Day present he has been waiting for… Well made… Withstands teens … Fast delivery! Bought this for my wife. She loves it.Awesome quality affordable price. I have tried it on and it fits well, but have not taken it out in the field to try it. I got the Medium/Large. I have 36 waist and 32 inseam and the pants fit perfect. I usually wear XL on most shirts/jackets, and the jacket fits well over my clothes. The hat/hood provides great coverage from your head over your shoulders. Hey, I like this and I haven’t even had a chance to try it out yet. The colors will fit my environment well. 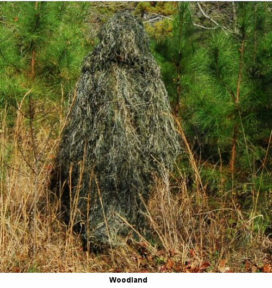 Never thought getting a ghillie suit would be this easy. I definitely plan to fool some of my best tactical friends. I am definitely going to get this. The suit was for my son for Christmas. It fits and looks great. He is very happy. Thank you very much. Great service, too!!! 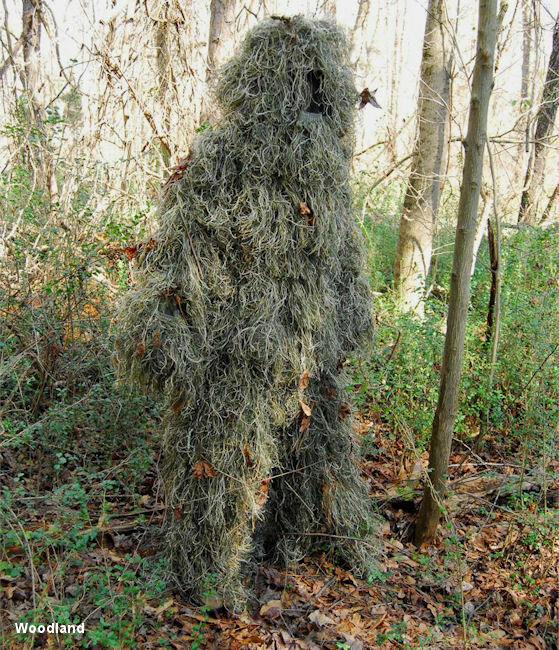 I ordered this ghillie suit as a Halloween costume for my 11 year old son. It went over great!! It is good quality and looked just like it did in the pics on the website. That’s really all I can say, since we did not use it for its intended purpose, but I took some great pics of my own and wish I could post them as well! It survived an 11 year old running through the neighborhood trick or treating, and still looked good, except for some leaves and twigs it picked up along the way.